I haven't had a chance to tell you about our trip to Sovereign Hill, Ballarat, when we were in Victoria. What a great place! Soverign Hill is a small village that is a replica of the goldfields in Victoria in the 1850s. In effect, it is a living museum. People work there in pioneer costume, as shop owners, tour guides or as actors playing the parts of soldiers,miners, town criers and settlers. School children can visit and take part in an 1850s classroom. It is so interesting to watch! Making a gold bar worth $100,000!! I so loved the old buildings, and the whole atmosphere of the town. 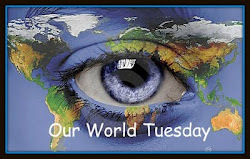 I'm linking up with Our World Tuesday, because there are such wonderful sights to see there! A fascinating place to visit. Imagine living in some of those small shacks. Life was hard back then! I think we would have been fine - it's only because we know what we have now. Imagine what people will think of our houses now in 160 years time? What a great set of photos. I really felt I was on the tour with you. Great post thanks for sharing. What a great set of shots from a great place. When my kids went with school they did not stop talking about for days!! Hi there (again!) - thanks for the comment on my "wordy" blog - no books as yet - but I can always dream! Do it, my friend. You have talent! I enjoyed browsing through all the photos. The old building looks wonderful and it's nice to know that there are still places like this existing. Thanks so much for sharing your outing with us! Old times are so interesting! Were you able to catch Blood on the Southern Cross?